If you're looking for the hottest new digital cameras, you're in the right place. As technological advances continually make everything smaller and faster, we've seen an explosion in the capabilities of the latest digital cameras. 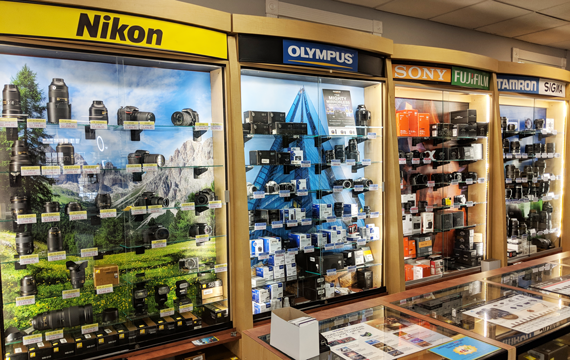 Check out our favorites below or browse our selection of digital cameras online. If we can answer questions or help you find the right fit, Contact Us or stop by the store and we'll make sure you get exactly what you're looking for. The Canon EOS 7D Mark II digital SLR camera is designed to meet the demands of photographers and videographers who want a camera that can provide a wide range of artistic opportunities. With a winning combination of cutting-edge operations and a robust, ergonomic design, it is optimized to make even the most challenging photography simple and easy. Compatible with an ever-expanding collection of EF and EF-S lenses plus a host of EOS accessories, the EOS 7D Mark II is an ideal tool for creative and ambitious photography. For those who find inspiration everywhere, who switch between stills and video without missing a beat, who want the look only a full-frame DSLR can achieve and who love sharing their shots, the Nikon D750 is the tool to unleash your artistry. The D750 brings dazzling image quality, cinematic video capabilities and pro-inspired handling in a nimble design with a tilting Vari-angle LCD and built-in Wi-Fi connectivity. Sharing DNA with Olympus’s acclaimed OM-D series, the new OM-D E-M10 is an elegant camera that looks as good as the photos it takes. Boasting a powerful TruePic™ VII image processor, interactive EVF, warp-speed AF system, built-in flash and WiFi, and a slew of creative tools, the E-M10 is a small camera that gets the big picture. The Sony α6000 is a compact mirrorless camera that is half the size and weight of a conventional DSLR, but whose power and performance exceed many current DSLRs in the market. It's E-Mount System and an array of lens options make the α6000 more versatile than almost any other camera on the market.